In New Zealand, a bach is a tiny summer or beach home. This bach was made from a small 20-foot shipping container by Cecile Bonnifait and William Giesen. 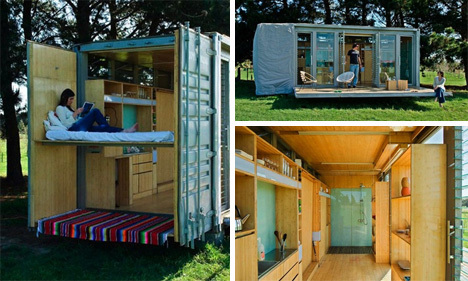 The clever design makes use of every available inch of space, even using the open doors as a support for a bed. Though the interior is a little cramped when it’s closed up, it becomes airy and spacious with the doors opened. The bach comfortably sleeps two adults and two children, which is more spacious than some camper vans.